The nature of any belief is that once you adopt it you will tend to defend it and seek evidence to hold it to be true. If you believe you cannot, then you will make sure that you don’t succeed. You will find plenty of evidence to keep the belief alive. 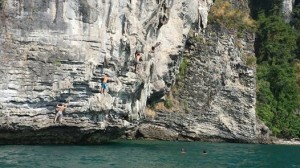 I was recently on holiday in Thailand were a group of friends hired a long tail boat to try rock climbing over the sea. As I approached the high rock, jutting out of the sea as I saw a rock climber hurrdle himself off the rocks after what seemed like 10 mins of deliberation. I was nervous for him due to the height of the fall but also because of the deep sea that lay underneath. I am the type of swimmer that likes to be able to put their feet on the ground quickly while swimming if needed. 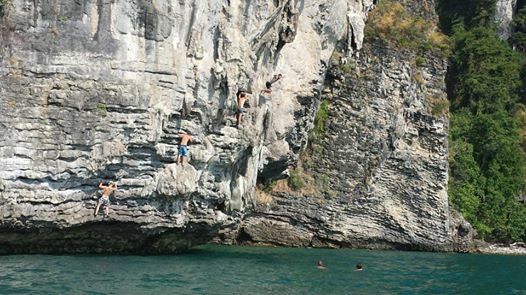 I didn’t trust my swimming ability to make it from the boat to the rock face, never mind hurrdle myself from a cliff. As our boat settled I watched all the men jump jofully from the boat and climb up a flapping ladder to get to the first run of the climb. I watched as they tried to contort their bodies into shapes while balancing on the cliff face. Only one member of the group was unable to pull himslef up the ladder. As I watched him fumble and fall off the ladder I instantly thought that will be me, I won’t get up that ladder, it’s too hard. I put my life jacket on and swam over to the rock all the while thinking I am not going to make it up. I am going to make a fool out of myself. I started the climb and was surpised I made some head way. Just nearing the top I lost my footing with one step and decided again no I cannot do this I am going to jump back down. And I did to my regret. I could of made it up that ladder, if only I had let myself! What beliefs are you holding onto that are holding you back. What do you need to concentrate on to help push you forward?